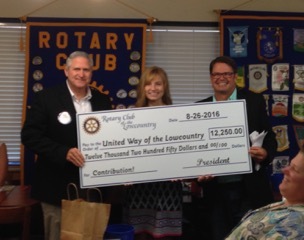 Lowcountry Rotary Supports United Way in a BIG Way! Rotary Club of the Lowcountry recently presented a check in the amount of $12,800 to United Way of the Lowcountry to be distributed among several groups. Representatives from Friends of the Spanish Moss Trail, Adaptive Gold Experience, Habitat for Humanity, HELP of Beaufort, Hopeful Horizons, CAPA, YMCA, Special Olympics, SMILE Mobile, Friends of Hunting Island, Wreaths Across America and Team Beaufort member and weightlifter Dade Stanley were in attendance. 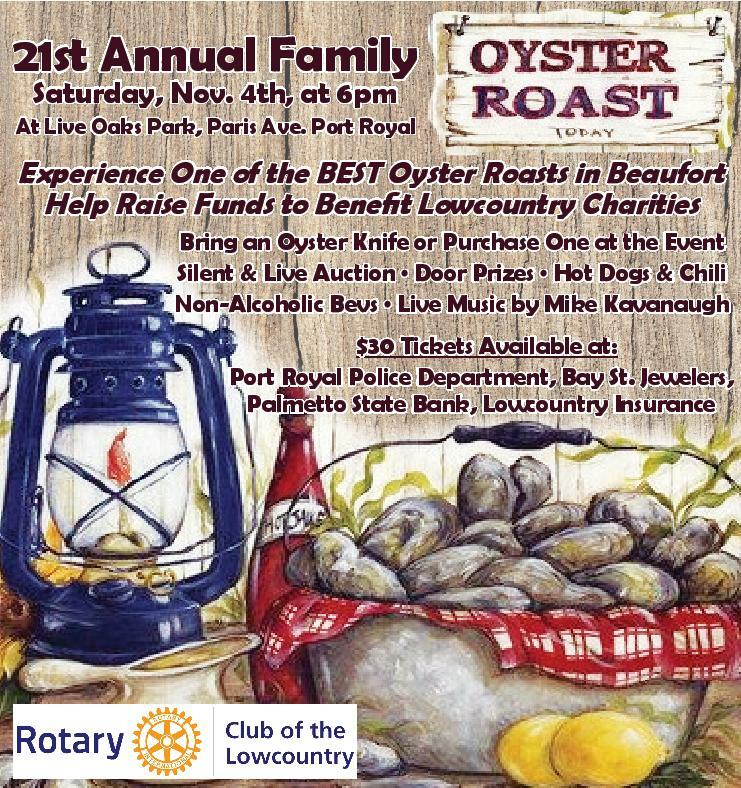 Money is raised by Rotary Club members through yearly fundraisers including Port Royal Charity Crab Race held in conjunction with the Port Royal Soft Shell Crab Festival and the Annual Family Oyster Roast held the first weekend in November. Rotary International is a service organization who values service above self. Rotary Club of the Lowcountry meets Friday morning at 7:30 am at Golden Corral on Robert Smalls Parkway. The club always welcomes people interested in becoming members. 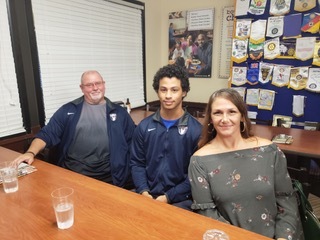 Team Beaufort weightlifter Dade Stanley pictured with his mother and Team Beaufort weightlifting coach Ray Jones. Club President Cliff Mrkvicka presents the check to United Way of the Lowcountry Philanthropy Specialist Mae Armoly Young. Rotarians from the Rotary Club of the Lowcountry recently sent off our contributions to the CART Fund and Celebrated with a giant commemorative check! This amount is the total we collected through our blue buckets on the tables at each week's meeting, money donated in honor of our weekly speakers, plus proceeds from our annual Memory Links Golf Tournament. AS you may know, CART is an acronym for Coins for Alzheimer's Research Trust. Every dollar donated to CART Fund goes to cutting edge research to find ways to cure, prevent, or treat this debilitating disease. 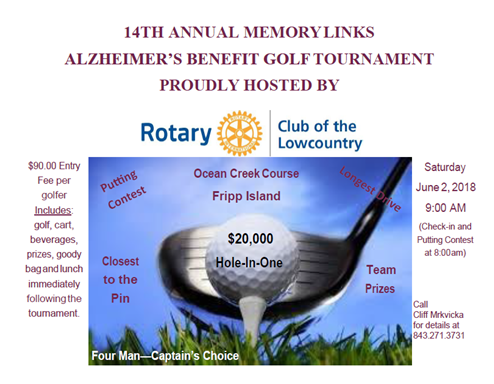 Great Job, Lowcountry Rotary. 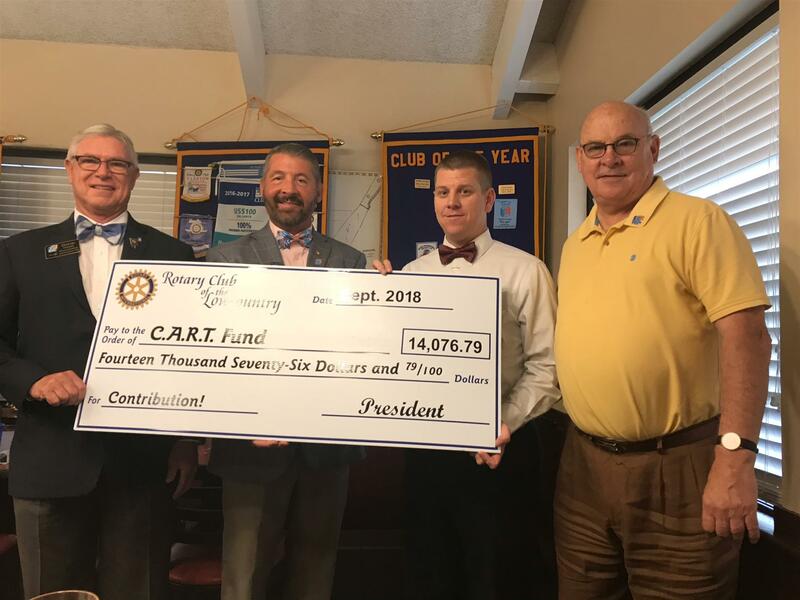 Shown in the picture are District 7770 Governor David Tirard, Club President Cliff Mrkvicka, Immediate Past President Scott Klumb, and Area CART Fund Coordinator Steve Lanier. And don't forget the CART Fund gala on November 1. Contact Steve Lanier for details. 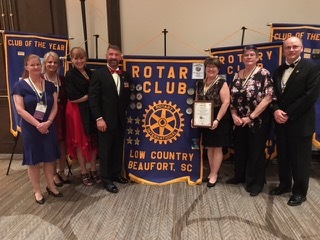 Rotary Club of the Lowcountry received the District 7770 Club of the Year award for medium size clubs at the District Conference held in Myrtle Beach recently. This is the first time the club has earned this distinction. The award was given for outstanding commitment to excellence, impactful leadership and unparalleled service to the ideals of Rotary and Rotary District 7770. 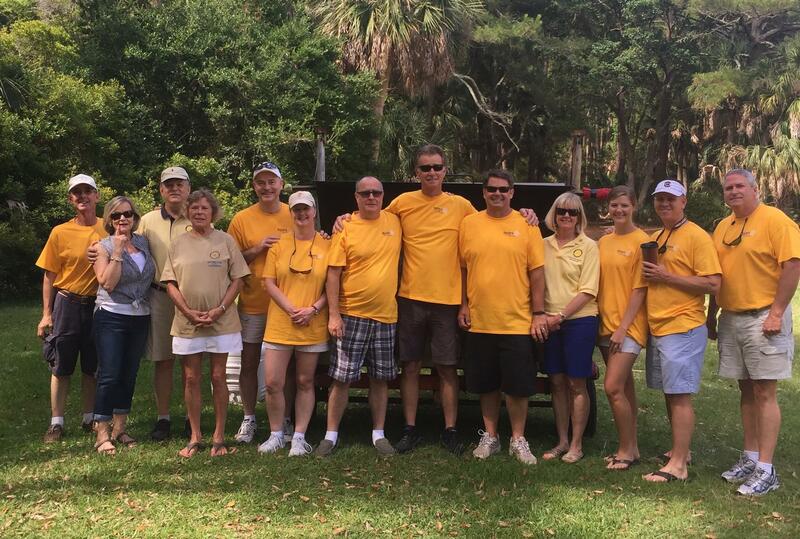 The theme of Rotary for 2017-2018 is “Rotary: Make a Difference.” Rotary Club of the Lowcountry is proud to have “Made a Difference” in the Beaufort community. Rotary Club of the Lowcountry members attending the District Conference include Paula Bunton, Kathy Crowley, Michelle and Cliff Mrkvicka, President-elect, Assistant District Governor & Past Club President Charlotte Gonzalez, Kathryn Parker and Past President Kerry Bunton. The Rotary Club of the Lowcountry celebrated an extra busy day of fun, fellowship, and music on December 16th, starting the day early with Adopt A Highway, and braving the bone chilling cold weather along with our wonderful Beaufort High School Interact Club. Immediately after, our members took different shifts ringing the bell for Salvation Army. Santa’s elves were out in full force, complete with a singing, guitar-playing elf leading both volunteers and shoppers in Christmas carols and holiday songs. 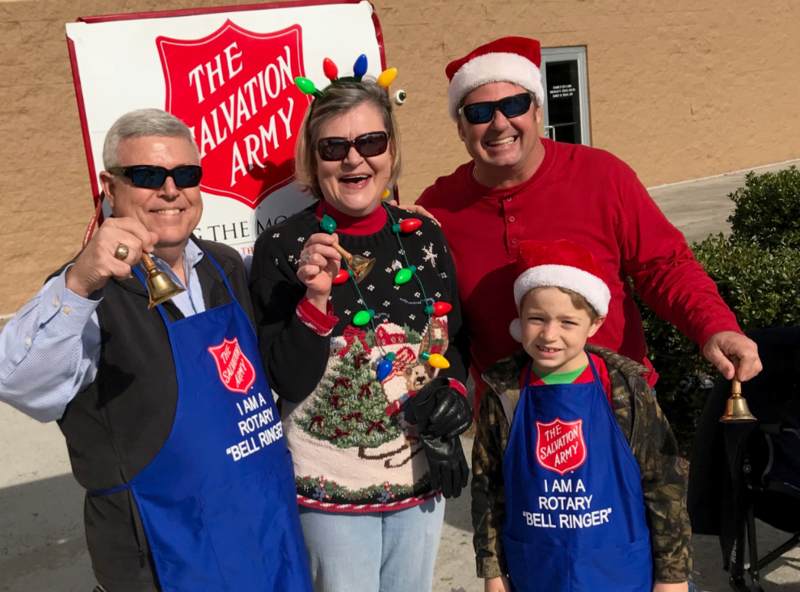 Our club always has a heartwarming time ringing the bell enjoying smiles and collecting donations for the bucket. Lastly, on the busy agenda was our participation in Wreaths Across America at the Beaufort National Cemetery. Volunteers joined together to place a wreath on a veteran’s grave to say that veteran’s name aloud and take a moment to thank them for their service to our country. We thank everyone who participated in the busy day and continue to be amazed at the incredible generosity and service of our club members! Look for more photos in our Photo Albums. Have you seen us on the Big Screen at the Beaufort Water Festival? Do you recognize some of our members? Would you like to learn more about the best Service Organization in Beaufort County (and in the World)? Get in touch with one of our 40 members and come for a visit. We meet almost every Friday morning at the Golden Corral on Robert Smalls Pkwy. Oh, and if you saw the video in Waterfront Park but didn't get the sound, you can watch it and listen in by clicking the YouTube link below. Terri Stokes ran a great program on the last Friday in August with a focus on membership. 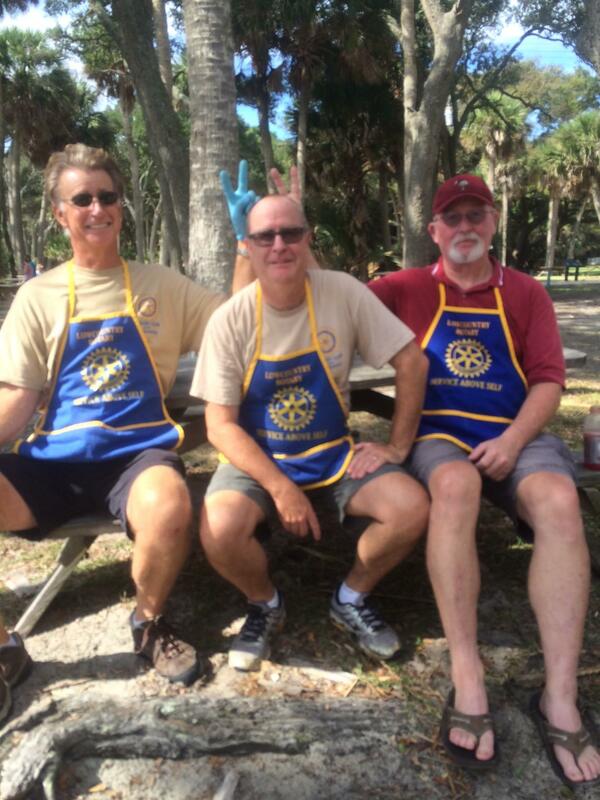 Several members spoke on who introduced them to Rotary, what Rotary means to them, and why they stay in the club. The words we heard several times were about giving back to our community, volunteering, and how we have become a family! We can truly accomplish more together than any of us can on our own. Kathy Crowley put together a wonderful slide show of our members and families recently. If you have any doubts that we are the "Fun Club" just watch this video. Let's keep doing good things and having fun doing them! 2 Service Projects and a Social--In ONE Day! On Friday, April 24, we gathered in the morning for a very informative meeting on DragonBoat Beaufort, but right after work we got down to business. We landscaped our 2 entrances of the Spanish Moss Trail. Lowcountry Rotary adopted this section of the trail from Brotherhood Road to Riverside Drive last year and we spent a little time adding some plants that should make these two trail-heads more attractive. Be sure to take a look at the Photo Album on this event on our home page. Then, we moved on to Alice and Gene Howard's house for a social and another element to a service project. Our club is donating about 140 books to the Beaufort County School District to support our Anti-Bullying initiative. We took a little time out from the social to put some "Donated by Rotary Club of the Lowcountry" stickers inside the front cover of each book. 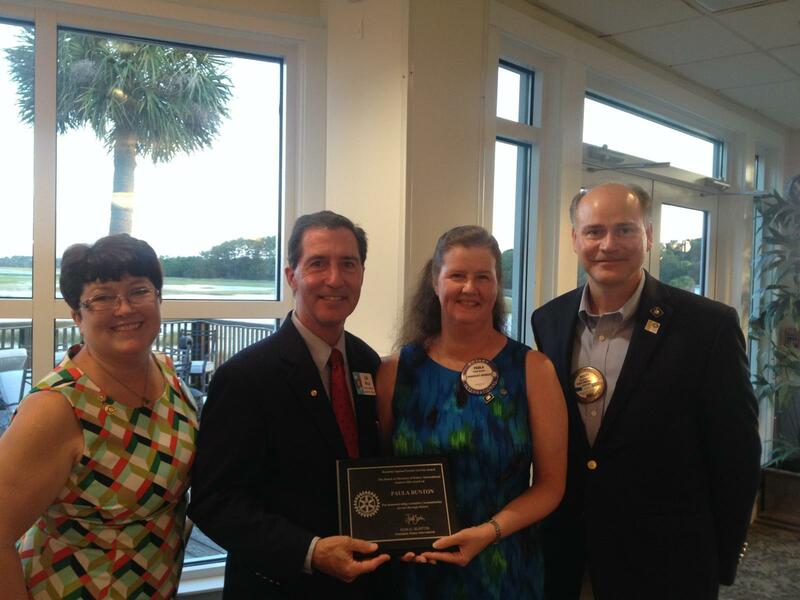 Paula Bunton, spouse of Rotary Club of the Lowcountry's member Kerry Bunton was honored with Rotary International's Spouse Service Award last night. Lou Mello was on hand at Area 5's Joint Installation Dinner to present the award which is one of only 100 given worldwide. We are so very proud of her and truly appreciate all she does for our club.